Don’t let arthritis hinder your day-to-day activities. IMAK Arthritis Gloves are one of our bestselling products thanks to their innovative design, and now you can enjoy the same level of arthritic pain relief without sacrificing your usual daily activities. IMAK Active Arthritis Gloves feature anti-slip dots across the entire palm and fingers to give you better grip. An orthopaedic surgeon designed the IMAK Arthritis Gloves to ensure the perfect combination of pain relief, support and usability. The gloves apply firm enough compression to keep your hands warm and encourage blood flow, which in turn helps to prevent inflammation, keeps the joints mobile and relieves the nagging aches and painful twinges that arthritis causes. Plus, the fingers are long enough to cover all of your knuckles, which are often the most painful areas for people suffering from arthritis. The material is a soft cotton and lycra mix which allows the skin to breathe and prevents sweating or irritation when worn for long periods. The material also allows for a generous stretch, making it easy enough to get the gloves on and off. With the added anti-slip dots the IMAK Active Arthritis Gloves are suitable to wear whilst writing, typing, texting, doing crafts, sports, gardening or housework, without the risk of objects slipping in your hand. IMAK Arthritis Gloves are so user friendly that they were awarded an Ease-of-Use Commendation by the Arthritis Foundation. IMAK Active Arthritis Gloves are available in 3 sizes, Small, Medium and Large. 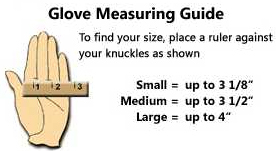 To find the correct size for you simply measure across your hand as the diagram demonstrates.